For pipe fit up, the proper use of the Hi-Lo Gauge can reduce weld rejections eliminating the need for costly repairs along with saving time and improving productivity on the line. The Hi-Lo Gauge is available in imperial and metric sizes. 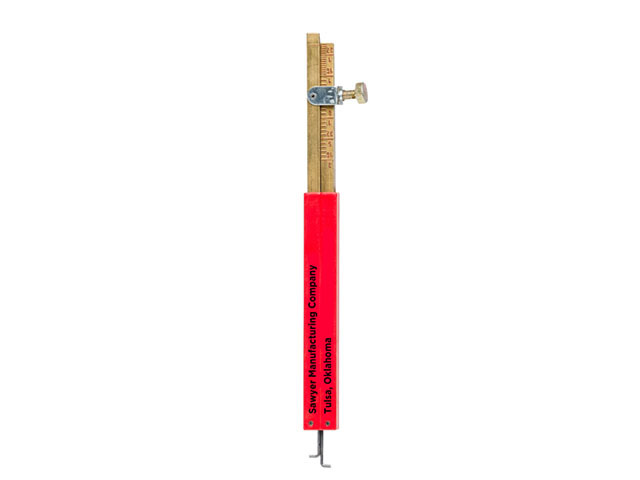 This pipefitter gauge is easy to use with measurements obtained in seconds. The Hi-Lo Gauge accurately measures the internal alignment of pipe and can be left in place while the welder makes any necessary alignment adjustments or reforms the pipe with an external clamp. The Hi-Lo Gauge can work in conjunction with a number of other Sawyer tools, including spacing wedges. The gauge can also be used to measure the weld gap to minimize weld rejection. On a minimum order of 500 pieces we can engrave your company’s name on the aluminum body and supply it in any of the primary colors. The Hi-Lo Gauge is one piece of the arsenal of pipe welding tool comprising the line of Sawyer tools that are built for welder ease of use and productivity. For pipe welding tools, the line of Sawyer tools and accessories, including the Hi-Lo Gauge is hard to beat and is certain to improve productivity and efficiency.